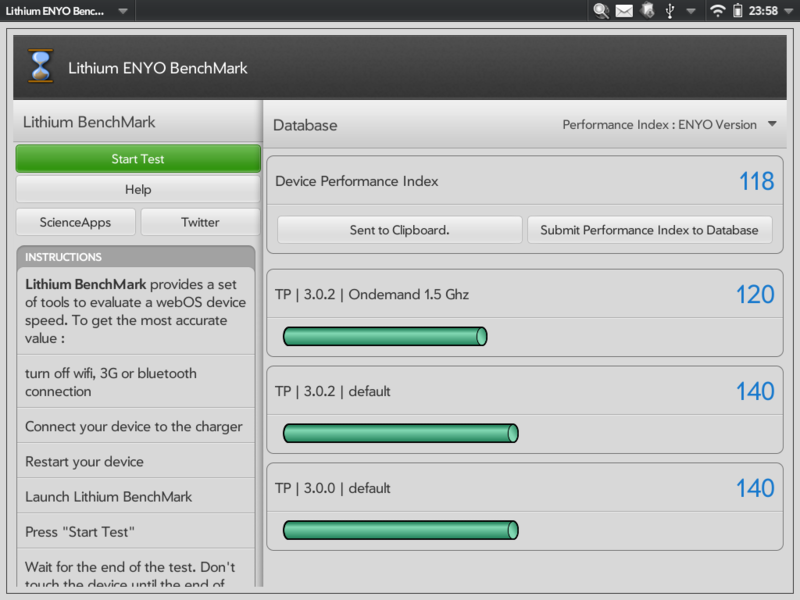 Lithium BenchMark provides a full set of tools to evaluate a webOS device speed. It’s available on every webOS device from webOS 1.4.5 to webOS 3.x. What is performance index ? The performance index gives you an idea of CPU & RAM performance. Lower is better. My Performance index is higher than Performance index in database. There’s something wrong on your phone or tablet, restart the test to get more values. If your performance index is still higher than performance index in database, you may doctor your device. How to submit your performance index ? Press on “Submit”.. If you are using patchs or modified kernel, please add these informations. How to Share my device performance index on Twitter ? Press “Share on twitter” after test is finished. The status will be sent to the clipboard. Then, paste it in your favorite Twitter Client. Why Pre3 performance index is lower than TouchPad performance index ? On the TouchPad, Lithium Benchmark runs on one single core at 1.2 GHz. On the Pre3, the single core frequency is 1.4 GHz. That’s why Pre3 may have a better performance index than the TouchPad. To compare TouchPad & Pre3, divise by two the TouchPad performance Index.